When I was a child, how many times, did I hear : "tais-toi, mange ta soupe et tu grandiras?." It may have been a combination of talking too much, not eating enough soup -I was never keen on dehydrated food and my mum's culinary skills don't extend much further than boiling water- anyhow I never grew much and at 5'2 I stopped. But I never stop eating soup and the arrival of autumn and winter is always a delight as it signals the start of warm, flagrant bowls of delicious vegetable offerings. The first of the season, appropriately is the traditional hand warming pumpkin soup, by the way, the recipe was send to me by Loseley butter's PR. I did not expect much from a tub of butter which calls itself summer meadow, but this is really a good product so if you come across it, don't hesitate to buy it; downside it makes this soup a little on the fattening side and you might end up growing larger rather than taller. Melt the Loseley butter in a large, lidded saucepan and add the onion and carrot. Cook gently to the boil, then reduce the heat, cover and simmer for 30 minutes, until all the vegetables are soft but not brown. Add the pumpkin, milk and seasoning and bring gently to the boil, then reduce the heat, cover and simmer for 30 minutes, until all the vegetables are soft. 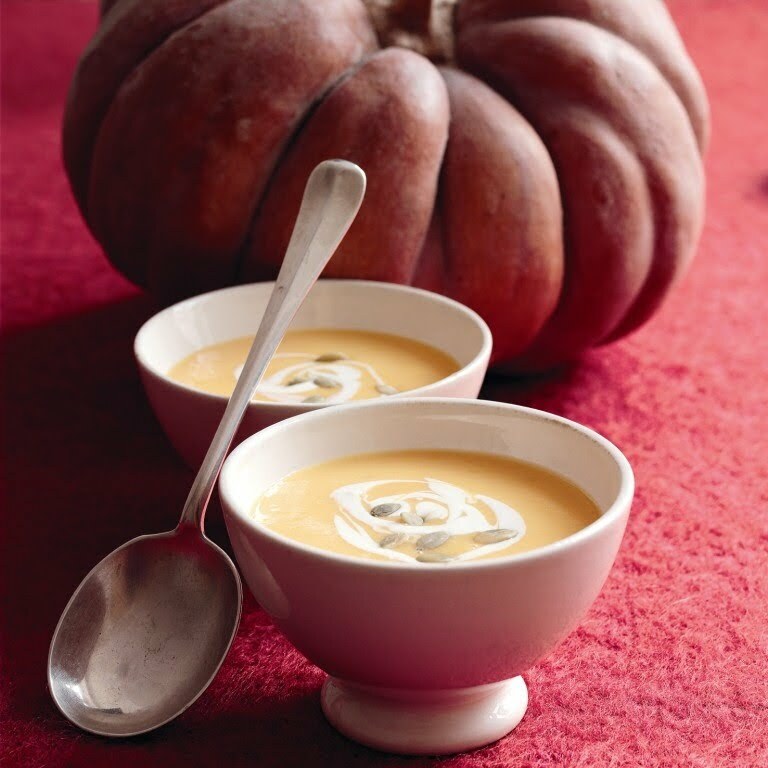 Transfer the soup to a blender or food processor and puree until smooth, in batches if necessary. Return to the saucepan, reheat gently and serve swirled with yoghourt and garnished with pumpkin seeds. Accompany with hunks of warmed bread. Roll the drums. Open the curtains. Let's the party begin. The book on which I worked with Alanna Lynott and Anne Mortensen will hit the shelves on the 1st November and we are going to celebrate with a pre-launch party at Waterstone's Picadilly -London- on the 27th October from 6.30. As Pebble Soup's readers are never far from my mind, I have saved you one complementary ticket. It will allow you free entry to the Champagne bar at Waterstone (inc. free drinks and canapes) You will be able to mingle with all who contributed to the book, most of the writers will be there minus these on holidays or on other life quest. Post a comment to tell us the title or the author of the latest book you have read. You could double up your chances by joining Pebble Soup followers. Each follower's name will be entered separately. Now, for these who have not been paying attention, yes, these reading quietly at the back of the blog, near the stove, not far from the food. Let me tell you what the book is about. Alanna and I set out to interview 30 contemporary authors, some are really famous, some are less so. We tried to cover as many genre as we could. 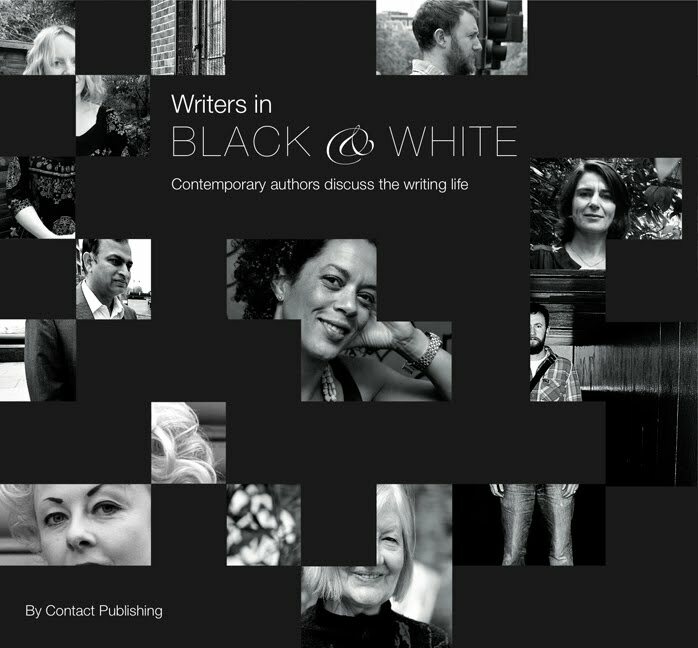 We ask them about their writing life while Anne took black and white pictures. The aims was to collate as much advice as we could and the targeted audience was to be budding writers. It soon became apparent that the content of the interviews was much much more than that. We are so proud of the end product. It is a beautiful book full of rather moving, enthralling testimonies about what it means to be a contemporary writer. Readers and/or writers will find that there is a lot of food for thought in this book. To read a little more about it drop by its website. ◦Only one entry per comment. ◦The winner will be randomly chosen by putting all the comments numbers and followers' name in a bag, shake the bag and draw an entry. ◦Ticket will be posted immediately. "The Gun" gastropub in the Docklands is indeed a rare place. With several awards attached to its name, its has a fascinating and tangible history. It was Nelson's local, won the best dining pub title by the Good Pub Guide 2010 editor, beating about 6,000 venues; in 2005 it got the Time Out's best gastropub award and has recently re-re-opened after a muted and classy refurbishment. Last Friday, it offered us a once in a "some-time" experience. The first impression was that for all its history, uniqueness and awards, The Gun remains a local pub and a good one too. There has been a public house on the site of The Gun for over 250 years. The pub dates back to the early 18th century. It took its current name from the cannon which was fired to celebrate the opening of the West India Import Docks in 1802. In the late 18th century, Lord Horatio Nelson acquired a property just up the road (still known as Nelson’s House) Lord Nelson would frequent The Gun and regularly meet Lady Emma Hamilton in an upstairs room (now called The River Room) for their secret assignations. The Maitre d'ho opened the River Room for me, it has recently been restaured to its former grandeur. Engulfed by the smell of wood and beeswax I had no difficulties to let my imagination run. I was on the deck of a boat with the sea around me, it even had an imperceptable sway that it because this room with its high ceilings is high up above the river so one get the impression to be at sea. In the river room you really are "at the captain's table." In 2001, a terrible fire destroyed much of the interior of the old building and the pub remained closed for 3 years. Then, current owners and brothers Tom and Ed Martin acquired the premises and spent about 9 months painstakingly restoring the magnificent Grade II listed building in close consultation with English Heritage. And they have done a really good job of it. Though now delicately painte white with its wood stacks in the walls enclosure, as a designer statement, but also as a practical way to feed the various rooms' open-fires, it has an air of repectability. But it has not always been the case. The Gun has a long association with smugglers landing contraband on the site and distributing it via a hidden tunnel. To this day there is still a spy-hole in the secret circular staircase to watch out for “The Revenue Men”. The air of secrecy lives on. In one of the room I was shown a conceled panel, with a small tape on the joint, the wood creaked and dropped to reveal ...........a portrait of one of its alumni. As the docks on the Isle of Docks flourished so did the pub, becoming the local for dockers, stevedores and boatmen. Remaining very popular today. On Friday evening, the restaurant room was full, nicely busing. We were shown to a table for 2, snuggly placed at the back where we had a good view of the diners and yes the table wobbled but I am yet to visit a restaurant where tables do not quaver. The waitress brought plain and rosemary square rolls, I am telling you square rolls are all the trend. That or it is a small clue telling you "Not only a pub but a gastro pub." In pubs, you normally don't get square rolls. Too often, you don't get any bread of any description, outside that in your sandwich. Pubs do not offer you bread, you have to ask for it....if you are brave enough. I agonised over the choice of starters. I wanted Pig’s head terrine & Smoked eel. Of course these 2 traditional pub dishes don't really go together, I needed to choose. Decision, decision. This is when I remembered that my neighbourg -Mrs Taylor- not long ago entertained me with the tales of the 40's, when she grew up. They (people in general) had only 2 delicacies to perk up the boiled vegetables, eel and pig. By the look on his face, he possibly would have starved if he had been of a previous generation. The Gun's menu which offers game broth, ox tongue, snails, potted shrimps, oysters possibly feed his nightmares. However, on the specials board there were filet of venison with mushroom, shallots, girolles and onions that solved the crisis. My terrine was slightly too "loose" but very, very tasty and he liked his venison. Though pulled a funny face when he realised the elegant starter was a carpaccio version and each thin slices had barely spent more than 30 seconds in a searing hot frying pan. It may well have been a first for my partner but I am sure that he liked it: "But not as an every day dish, you understand". Quiet right as this is not every day's food, and in my humble opinion it deserves its Time Out’s Best Gastropub title. Break/Onto the main, that gave us a little time to observe the service which was variable but definitely pleasant. On the main courses list, besides the fishcakes and the risotto reminiscent of pub food (at least in names), the rest of the offerings are more like restaurant food. I opted for Roast Swinton Moor (Yorkshire) red leg partridge, braised legs, choux farci, salsify, game jus which was definetly the best cooked partridge, I ever had, moist to perfection, certainly a satisfaying generous portion, the presence of salsify rejoiced me no end. He chose Mallard on a bed of mash vegetable with chips and extra chips from the specials. The wild duck was liked too. By then, we were both full so we opted for the cheese to finish our Gigondas (as the expression goes in France: un petit peu de fromage pour finir ton vin? or if you are lucky, un petit peu de vin pour finir ton fromage.) In this case we also had a glass of aged Port. The bill for would have come up £128 for two including drinks and coffees. It was time for our verdict in digits. The Gun scored a high 8.5. "Proper" beer on the terrace with a view of the dome and the river added to the pleasure of an evening in a historical place which cleverly combines traditional British pub food and the restaurant experience. First rule of writing: find a thread and keep to it. I am afraid this is not going to work today 'cause I have plenty of things to share and they are not inter-connected. Thing number 1: Would like to say "hi" to my only Indian reader, you may well be the only person to read Pebble Soup out of 1,139,964,932 Indian dwellers but I like you even better for spending a incredible 23 minutes reading it at each visit and if you and anybody else out there wanted to join the group of followers, do not hesitate to click on the left hand-side button. Thing number 2: Tried to cook fennel for the very first time, last night. I thought I did not like fennel, I have a thing about aniseed. Strangely the aniseedy taste is very mild. This might be because as I learnt this morning, there are 2 kinds of fennels: the wilder kind which is stalky and which I remember from the south of France stuffed in fish. Thing number 3: cooking in a bag or "en papillote" as we call it in French. Papillote is a Christmas chocolate treat, wrapped in a colourful paper containing a joke. A speciality from Lyon worth looking for. Thing number 4: today's recipe or rather last night's but you know what I mean. Preheat oven to 220C. Cut out four 36cm square sheets of kitchen foil or baking paper. Finely shave the fennel lengthwise. Scatter the fennel in the centre of each square and place the fish on top. Season well. Arrange a slice of orange and a bay leaf on each fish and scatter with olives. Drizzle with olive oil and orange juice. Bring the two opposing sides of the foil up and seal as tightly as you can with a crimping pattern, forming a half-moon bag. Crimp the edges twice if you can. Bake thin fillets for 10 minutes and thick fillets for up to 15 minutes. Remove from oven, open and drain the bag juices into a jug. Transfer the fish and fennel to warm dinner plates, drizzle with the juices and scatter with parsley. What is this a picture of? humble meatballs. Look again. These are geopolitical statements. All based on the same idea but each so very very different from their neighbours. I used to think that my grandfather's Moroccan fatty lamb meatballs filled with breadcrumbs, harissa, spices all sorts and a hint of mint were the best and only kind. Then, I discovered that my college friend Myriam Andreoletti, nowadays better known as clown "Julietta" and co-founder of the Bataclown, had beef and pork meatballs as staple-food on her spaghetti, . Travelling on, I enjoyed many Bakso breakfasts, Indonesian floating meatballs made of beancurd as next door in the Philippines Bola-Bolas are really crackling pork. And now I am told that New-York meatballs, possibly yet another version of Myriam's nana's recipe are all the rage. Unable to write down my childhood meatballs recipe so much it changed throughout the years. Here is the closest I found, in taste if not in location: Greek meatballs as described by Jill Dupleix recipe book "Lighten up". 1. Preheat the oven to 180°C/fan160°C/gas 4. Put the bread in a bowl and soak in the wine for 5 minutes. Lightly squeeze out the wine – reserving it for the sauce – and put the bread pieces into a bowl with the lamb, onion, garlic, egg, parsley, cumin and cinnamon. Season and mix well. 2. Shape the mixture into 12 medium-sized balls, each slightly bigger than a golf ball. Put on a large, non-stick baking sheet and cook for 20 minutes, until golden. 3. Meanwhile, combine the reserved wine with all the sauce ingredients in a wide saucepan. Put over a medium heat and simmer for 20 minutes, until thickened. Season. Add the meatballs to the sauce and simmer for a further 10 minutes, turning halfway to coat. Discard the bay leaf. 4. Divide the meatballs and sauce between serving plates. Serve with mashed potato and garnish with extra parsley. How often does it happen that a dish you have just cooked looks exactly like its recipe-book picture? hmmm? I am asking you. Well in my case, hardly ever. I am too scattered brain to follow a recipe step by step from beginning to end. Easily distracted and generally full of "that seemed like a good idea at the time" type of additions. But this time, I stuck my little tongue out, and paid attention and look at the result. Credit must be given where credit is due, though, Anjum Anand's recipes work. This is why in the foodie-blogosphere we like her recipe books. Anjum describes this recipe as: "more rice, less pilaff and normally made with southern rice which is often thicker and shorter whilst no less delicious. However you can use any white rice" so I did, used any old white rice. I can't remember what was the accompaniment for this tomato rice but I can remember the taste, one word : delicious. One drawback, it took me rather a long time to cook but that is possibly because I was trying to remember which line I had read last. 3 tbsp fresh or frozen grated coconut. Heat the oil in a large non-stick saucepan. Stir in the garlic, and chillies, and cook over a low heat for 1 minute or until the garlic smells cooked. Add the tomatoes and turn the heat up. Cover and cook for 5-6 minutes or until the tomatoes have softened. Taste- there should be nor harsh elements. Add the drained rice and stir-fry for 2 minutes. Pour in 430 ml water and the coconut, give it a good stir and taste. Adjust the salt at this stage. Bring to boil, then cover with a tight lid, turn the heat to its lowest setting and cook for 8 minutes or until the rice is tender. Turn off the heat, remove the cover and let any excess moisture evaporate.